Enhance your 9-days-Navratri-look(s) with dazzling bangles and bindi designs to choose from. Are you all set for Navratri? Whether it is pandal hopping for Durga Puja or getting ready with dandiya sticks for Garba Nights, whatever the case may be, you would have already decided on what to wear. Make sure to wear the brightest of the bright colors and don’t forget to accessorize well. Ladies, team up your ensemble well. 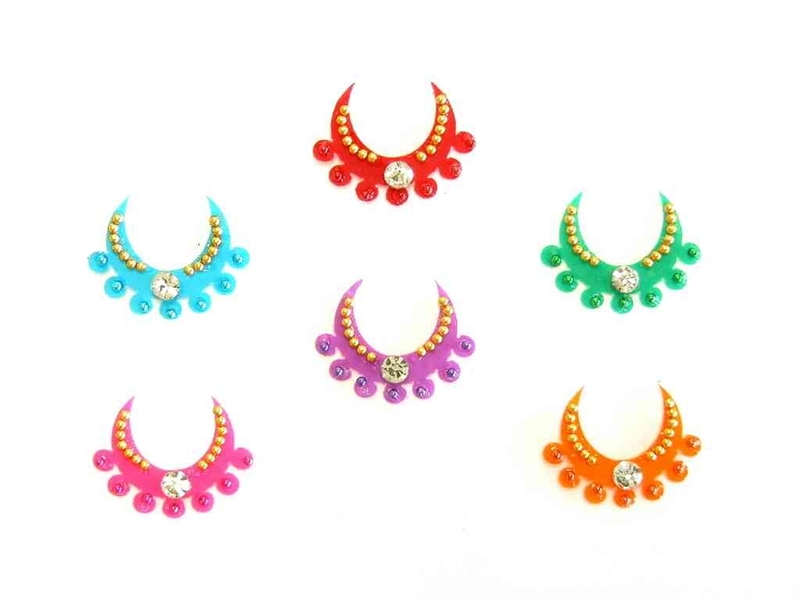 Don’t forget to wear a pretty matching bindi and bangles (well, it can be in contrast too)! Here are some gorgeous designs recommended by Zuri that will surely enhance your chaniya choli, saree-lehenga or fusion that you intend on wearing tonight and for the days to follow. If your style is traditional, try not to go overboard with the bangles. Rather, let the focus be on your colorful bindi. We recommend a kara in each hand or just a few bangles. If you prefer going for a blend of traditional and modern, then complete your look with heaps of bangles! There is a wide selection available in the market. From glass and ceramic to fabricated ones, from silver to metallic and lac too, there are plenty of designs and styles to choose from. If you want to experiment with the accessories, then you may opt for the stylish-innovative fusion of wooden and plastic ones. Besides, a solid cylinder type and a split, cylindrical opening/closing type, you can also wear a cuff or asymmetrical spring bangles. I personally prefer those with embroidery on them. But, my all-time favourite is the shimmery ones. However, sky is the limit when it comes to colors and designs. The other day, I spotted a friend wearing a thick kara with a painting and small hangings that were attached to it. Looked so ultra-cool. Those with an oval face can easily get away with a long-ish bindi style. 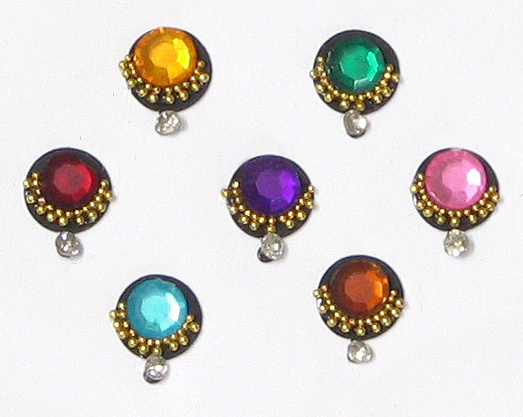 Round shaped face has a scope for long bindi, but try to avoid larger round ones, teardrops and diamond shapes. Ever noticed how Sonakshi Sinha wears her bindi? It is almost always a black line on her forehead! On a square face, V-shaped ones work really well. But then try not to go for long thin ones. If you want to try out something extremely different, then go for a butterfly. Sunrise, star, paisley, crescent, teardrop, rhombus, almost everything will suit you if your face shape is triangular. Rani Mukherjee has often flaunted a crescent shaped bindi style. Whether it’s a kum-kum or an embellished bindi, a cuff or heaps of glass bangles, whatever be the style, just indulge yourself this festive season and make sure to look stylish on Dandiya nights. Happy Navratri & have a great pandal hopping!